In this post, Sibyl Adam describes her experience of delivering a thought-provoking workshop on ‘Migration and Muslim Women’. As part of my research and my wider interests, I have always felt there to be a lack of ‘common knowledge’ about the fundamental aspects of immigration in Britain, as well as the history of Muslims in Britain. This has left a space in which the more negative representations, propagated by media outlets, are more readily accepted and believed. The issue is not the existence of negative portrayals and opinions, but the lack of positive and varied portrayals to ‘balance out’ the negative ones. Thus, I was very keen to be involved with the Moving Beyond Boundaries project. I have felt for a while now that education, especially with young people, is the most important method to help combat issues of misunderstanding and misrepresentation in the history of Muslims in Britain, especially Muslim women. My session on ‘Migration and British Muslim Women’ was combined with Gaby Leddy’s session on ‘Witchcraft in Early Modern England’, a topic which at first may not seem similar to mine. However, we found there to be many similarities concerning the representation of women, especially the use of stereotypes. In fact, the contrasting topics served to only highlight the prolific use of stereotypes in such distinct time periods in women’s history. I began by asking the students if they could name, out loud to the rest of the class, any famous British Muslim women. I was surprised by the varied and prolific response, which included Olympic athletes, TV presenters and members of the House of Lords. They were also aware of Muslim representations in TV and film, although generally those based on male protagonists like the film ‘Four Lions’ and the TV show ‘Citizen Khan’. This was a good start to my half of the session, as the students appeared engaged and open minded. I wanted to begin with the basic acknowledgement that Muslim women can be found working in every aspect of British life. I gave a short presentation on the history of why Muslim people have moved to and lived in Britain for hundreds of years and introduced two authors – Atiya Fyzee and Leila Aboulela. The main part of my half of the session involved three narrative extracts – two contemporary, fictional pieces by Fadia Faqir and Leila Aboulela and one piece of travel writing by Atiya Fyzee from the Edwardian period. I chose to use these pieces because they were different sources in which the students could engage. The travel writing was obviously a more historical source and the contemporary extracts showed the cultural production of Muslim women by Muslim women of different degrees of religiosity. I purposely chose extracts of Muslim women doing everyday things, such as going to work, going travelling, or visiting a mosque but these extracts also showed how their lives were specially affected by being women and Muslims. The extracts varied in positivity, which was done to counteract the stereotypical portrayals in British media of Muslim women as necessarily oppressed by their culture. In small groups, the students read and discussed the extracts, keeping in mind the questions of why people migrate, and how migration is different for women and Muslims. 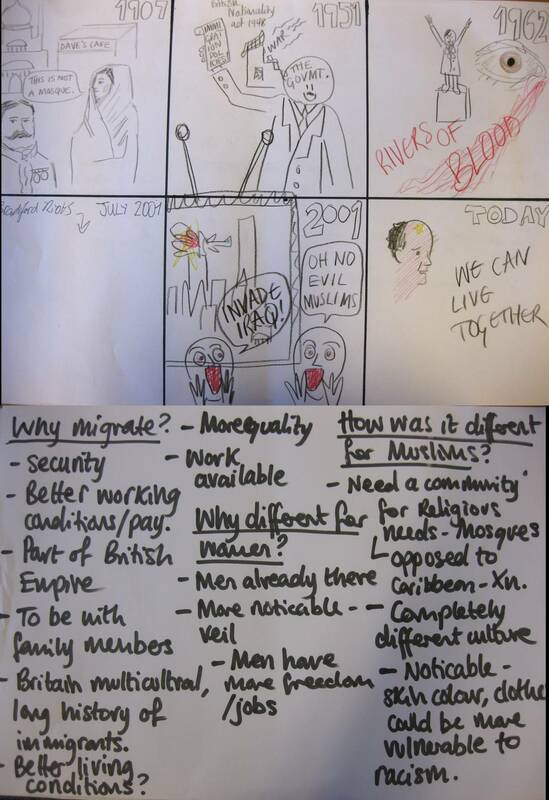 Following this, the students were asked to design storyboards on the subject of Muslim women and migration. These could be drawn like cartoons or film storyboards, and the subject of their projects could be contemporary and historical. 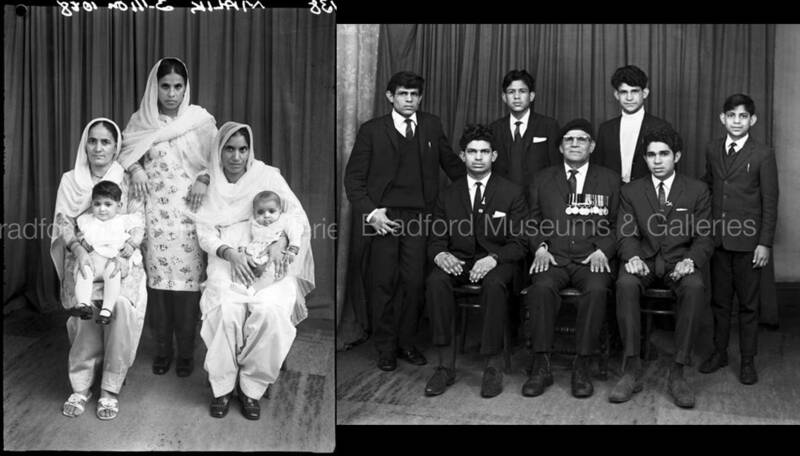 I also provided photos from the Bradford Museum photo gallery of migrants from the 50s and 60s. I wanted the students to engage with the way first generation migrants, mostly from predominantly Muslim countries and British ex-colonies, presented themselves, including their dress and facial expressions. I hoped this would provide extra inspiration for the storyboards and was pleased to see students aware of details such as, in one of the photos, the military medals on the suit of an elderly Indian man. The student deduced the man must have fought for Britain in a war and by displaying the medals must be proud to be British. There were varied responses to this activity – some storyboards used the extracts as inspiration and some created their own narratives. The group I was working with came up with the idea of showing different periods in modern history that involved Muslims in Britain. I was impressed with how the students included the relatively mundane scene, from the Atiya Fyzee extract, of a Muslim woman visiting a Mosque in 1907, alongside scenes of the famous Enoch Powell ‘Rivers of Blood’ speech, the Bradford Riots, and 9/11. I felt that this showed that they understood that Muslims have not always had such a threatening image in Britain, and that global events such as 9/11 have contributed to the negative attitudes towards Muslims in Britain. At the end of the session, each group of students presented their storyboard and narrated them. We then asked the students to talk about similarities between my half of the session and Gaby’s. Overall, I found the session to be a rewarding and interesting experience. I was particularly impressed by the previous knowledge and open-mindedness of the students, and I hope our project inspires them to think more about women’s history outside of the curriculum. 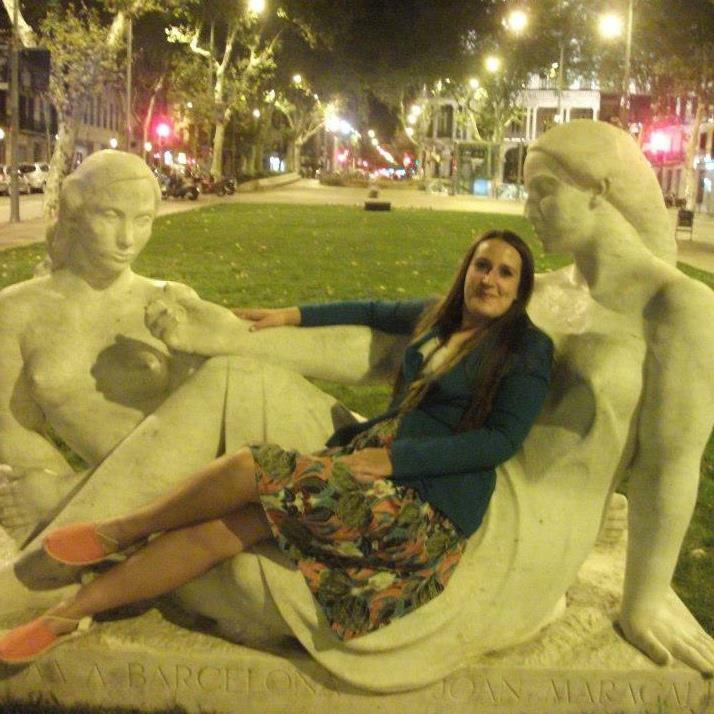 I did my undergraduate degree in English Literature at the University of Glasgow. I am currently on the MA Cultures of Empire, Resistance and Postcoloniality at the University of York, where I have developed my keen interest in British Muslim writing and feminist postcolonial theory. I hope to continue my studies next year with a PhD at the University of York, looking at the changing role of religion in Muslim women’s writing about migration since the Edwardian era. The aim of this research will be to determine the relationship between gendered religious identity and the changing image of Islam in British society.